This Friday, April 13, from 10am to 11am at Camp Charlie (on the steps of the Massachusetts State House), radical scholar, Marxist intellectual, and long-time social justice activist Professor Barbara Foley (Rutgers-Newark) will give a short lecture and help stir a discussion about what it means to maintain a radical perspective in the present political situation. Following the talk, there will be an informal discussion over lunch, from 11am to 12pm, to be held either on camp or at a nearby establishment. (Details on lunch TBA). For more information, please contact Joe at jgramsey@gmail.com. 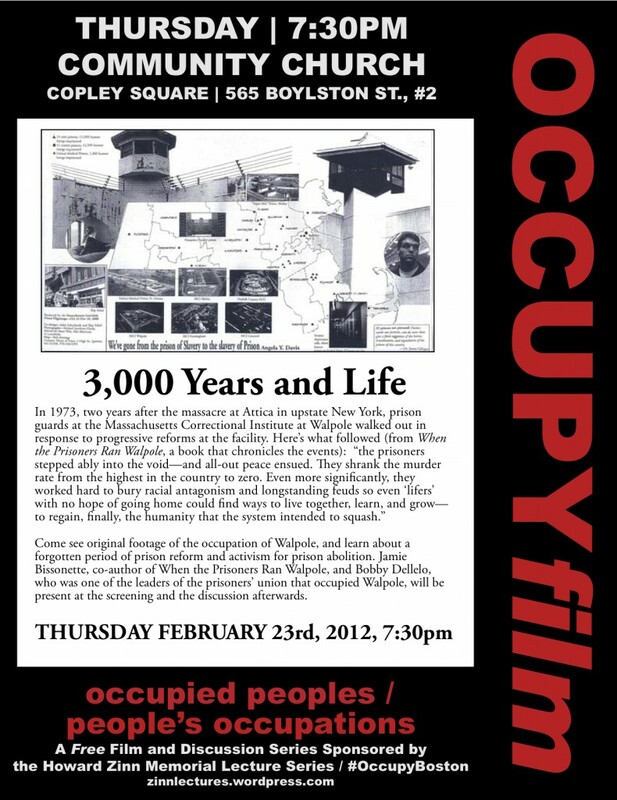 The Howard Zinn Memorial Lectures Series (part of the Free School University) presents Occupy Film: a film and discussion series on Occupied Peoples and People’s Occupations. 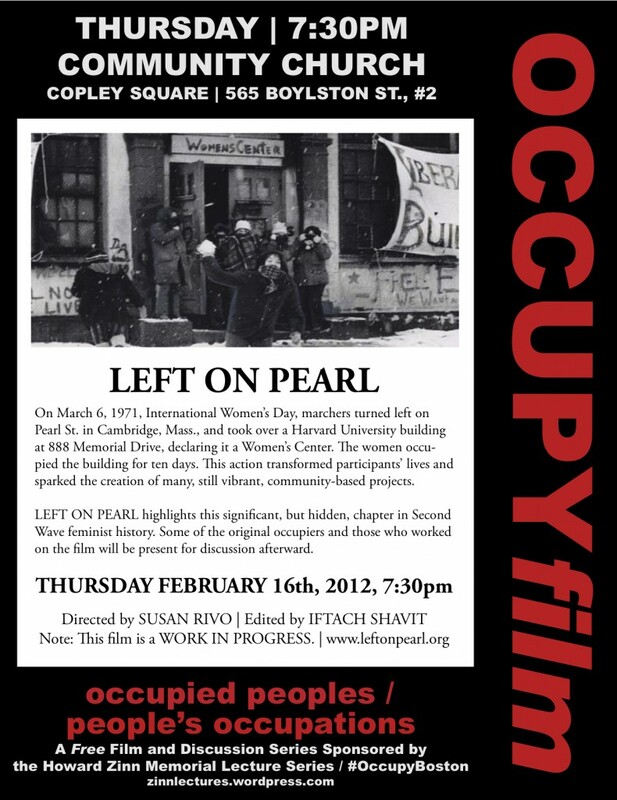 The first two films”Left on Pearl” and “3000 Years and Life” will be shown on Feb 16th and Feb 23rd at the Community Church in Copley square (see fliers below for more information about these exciting films). Aviva Chomsky speaking Wednesday on Immigration and Occupy. Saturday, December 3, 2011, 6:00 p.m at Encuentro 5, a short walk from Dewey Square. As discontent with the economic and political status quo mounts in the wake of the “great recession”, America Beyond Capitalism is a book whose time has come. Gar Alperovitz’s expert diagnosis of the long-term structural crisis of the American economic and political system is accompanied by detailed, practical answers to the problems we face as a society. Unlike many books that reserve a few pages of a concluding chapter to offer generalized, tentative solutions, Alperovitz marshals years of research into emerging “new economy” strategies to present a comprehensive picture of practical bottom-up efforts currently underway in thousands of communities across the United States. All democratize wealth and empower communities, not corporations: worker-ownership, cooperatives, community land trusts, social enterprises, along with many supporting municipal, state and longer term federal strategies as well. America Beyond Capitalism is a call to arms, an eminently practical roadmap for laying foundations to change a faltering system that increasingly fails to sustain the great American values of equality, liberty and meaningful democracy.